How to Paint a Landscape With Watercolors. 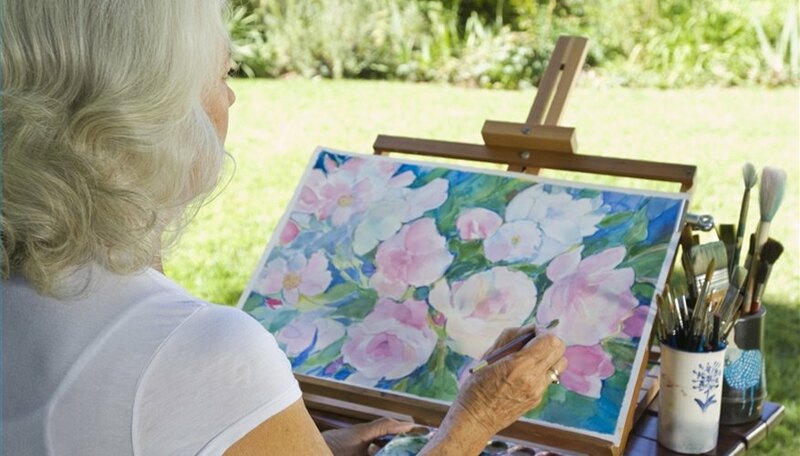 Painting outdoors is a peaceful way to enjoy a beautiful day. Keep a backpack full of painting supplies and you can be ready to go whenever the inspiration strikes. Tape a piece of watercolor paper to a heavy piece of cardboard using masking tape. Run the tape along the entire edges of all four sides of the paper. Use a soft lead pencil to begin your painting with a simple sketch. Locate and draw the horizon line, which is the line formed where the sky and the land meet. Sketch in the background objects: hills, mountains, distant trees. Background objects are typically smaller and have less detail than objects in the foreground. Sketch the objects in the foreground. These objects will be larger and more detailed. Use clear water and a flat brush to dampen the sky area of your picture. Create clouds by blotting the sky with a crumpled tissue while the paint is still wet. Use the same wash technique to paint in large areas of background color such as hills, mountains, water and grass. Paint in details using a small round brush. Mix paint with more water to create softer, lighter hues. Use less water to create darker, more vivid colors and harder edges. Allow your finished painting to dry completely, then carefully peel away the masking tape from the edges of the paper. This will leave a nice white border around the edge of your painting. Consider buying a watercolor block, which is a pad of water-color paper that is glued on all four sides. A watercolor block is rigid, which makes it easy to take anywhere so you can do without a drawing board. Postcard-size watercolor pads are available in many stores, and they're fun to take on trips. Friends will appreciate receiving a hand-painted landscape postcard from you.